What is a Diffusion Dome? Have you ever wondered how to reduce harsh shadows indoors when using your external flash? A diffusion dome is one solution. A diffusion dome is a piece of plastic that attaches to the flash head and produces omnidirectional light. The dome diffuses the light and scatters it around 360 degrees, softening the light as it’s reflected around the room. With a diffusion dome on your flash head, you can direct your flash upward and bounce it off the ceiling. However, a diffusion dome really only works indoors. If you are using a diffusion dome outdoors, it is ineffective: while you are scattering the light, there’s nothing to bounce it off of. A diffusion dome is also not very effective if you are shooting very far away from your subject. A diffusion dome is at its best if you are shooting indoors and have the option of bouncing the light off a wall or ceiling. To understand why a diffusion dome helps reduce hard shadows, it’s important to understand how hard and soft light are created. Hard and/or soft light is created by the size of the light in relation to the distance from your subject. The closer to the subject you are, the softer the light will be. Think about the sun: on a bright sunny day, the light comes from a very specific point in the sky, creating hard light with distinct shadows. However, on a cloudy day the light is diffused by the clouds and scattered across the sky so it’s softer with less distinct shadows. The same principle can be applied to your speedlight. Putting a diffusion dome or a softbox on your flash will spread the light across a larger surface area (almost simulating a cloudy day) which will provide a more natural-looking light. Think of a table lamp. Without a lamp shade, the light is harsh. With a shade, the light is pleasant and diffused, just like the light created with a diffusion dome on your speedlight. Bouncing the light off a wall or ceiling will also help reduce the harsh shadows since the angle of the light source is not straight on. Spinning the flash unit backwards helps to diffuse the light and disperse the light throughout the room. Some Nikon speedlights have a retractable bounce card which slides in and out. It’s a small white plastic sheet that can be pulled out from the flash head. The little bounce card helps to direct about 15% of the light back towards the subject, and creates catch lights in your subject’s eyes. 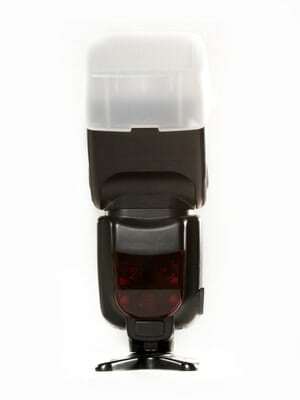 Some speedlights also have a retractable wide angle diffuser that pulls out and down in front of the flash head. The wide angle diffuser is more directional and spreads out to the sides more while the diffusion dome spreads out the light more evenly. The electronics in some of today’s speedlights (such as the Nikon SB800 or SB900) can detect when you zoom in and out with your lens. When you change the zoom on your lens, it will change the zoom of your flash. When you put your diffusion dome on the flash, it disables that function and instead does a really wide flash output.